How can you encourage your pastor? Well, you just did. By visiting this page you have shown that you want to be an encouragement to your pastor. And that in itself will be a support to him or her. Now you just need some ideas on how to encourage your pastor. I’ve listed 52 suggestions below. Pray for your pastor every day. 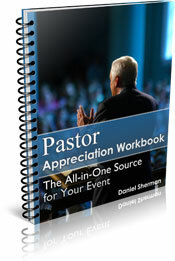 Send an email showing your pastor appreciation to your pastor and all your friends. Don’t use the blind copy email feature so that everyone’s name is listed at the top of the email. He will see that you are truly proud of him. Send him a greeting card with a personal message inside. Stop by the church and wash some windows. Take his wife to lunch. Make yourself available to teach a Sunday School class or work in the nursery during a service. Offer to help fold bulletins. Mow his lawn or shovel his driveway. Send his young children a greeting card with McDonalds gift certificates inside. Send a letter to his son or daughter who is away at college. Call a home-bound church member. Call his wife and ask what kind of pizza they like. Order it, pay for it, and have it sent to your pastor’s home. Smile a little during his sermon. Drop off some doughnuts, bagels, or fruit to the church office for the entire staff to enjoy. Babysit his kids so he and his wife can go out. Rent a billboard and use it to express your pastor appreciation. After a sermon, don’t tell him it was a great sermon. Pick out something specific from the sermon and comment directly on that. So many people tell him his sermon was “great” that he realizes their comment is the same as an American asking, “How are you?” We don’t really mean it … it’s just a greeting. Perform a surprise pastor appreciation skit. Have the 4 – 10 year old children in your church write down their answer to the question, “What does a pastor do?” Read the responses during a service. Write an article for the church newsletter about how thankful you are for your pastor. Get a group of people together to fast and pray for your pastor. Give him a surprise birthday party. Loan him your boat, four wheeler, or snowmobile. Let his family use your cottage or timeshare. Invite his kids to go to the beach with your family. Buy his entire family tickets to a sporting event. Write a story about your pastor appreciation and read it during a church service. Put an ad in the local newspaper expressing your respect for your pastor. Include a pastor appreciation poem in your Sunday bulletin. On Sunday, ask him what you can pray about for him this week. Then next Sunday ask him how things went regarding what you prayed for. If time is given during a service or event for public sharing, talk about something positive your pastor did recently that few people know about. Ask someone other than the pastor to pray before the next church meal. "Adopt" one of his children as someone you pray for, encourage, and support. Give him a pastor appreciation gift. Give his wife a gift. Give your pastor’s kids gifts. Write a letter to your church's leaders expressing your gratitude for your pastor. Listen openly to his ideas for change. Sing your heart out at your church worship service. Clean the church restrooms on Saturday night. Keep track of his, his wife’s, and his children’s birthdays as well as his wedding anniversary. Tell him you appreciate him … and why. Sit closer to the front during a service. Know the dates of when his parents (or child, sibling, close friend) died. Send him a card on that anniversary. Write a letter of pastor appreciation to your church’s denominational headquarters. Never publicly criticize him. If you have a concern or complaint, speak directly to him about it, or better, forgive him and forget it. I hope this helps you know how to encourage your pastor.